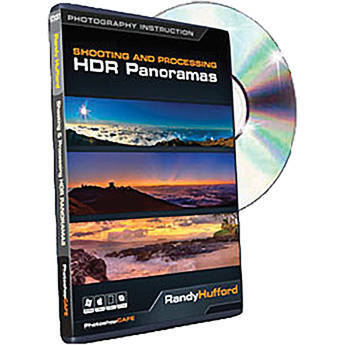 Shooting and Processing HDR Panoramas from Photoshop Cafe is a training DVD that teaches you how to shoot and process HDR panoramas. HDR enables you to capture every piece of detail, the colors, the textures and the emotion. Take that and turn it into a full sweeping panorama and you have the recipe for breathtaking images that will cause your viewers jaws to drop. Randy Hufford will be your personal coach, as he reveals the secrets to capturing the full intensity of the scene using these techniques. Take a front row seat, and witness the rare combination of someone who has mastered both the production and post production processes. This training DVD contains over four hours of training in beautiful, razor-sharp video. The advanced interface allows you to instantly jump to any of the lessons with complete control over the playback, including Full Screen. All the lesson files are provided, so you can follow along at your own pace. Randy Hufford is a Maui based artist and instructor. His great enthusiasm for photography is matched by a deep knowledge of the entire photographic process. From creating, printing, mounting and framing, Randy's keen eye and attention to detail make him one of the most informative instructors in the business. Randy is passionate about creating and selling his fine art images in galleries throughout Hawaii and the world. He shares his vision by teaching his methods at the Institute of Visual Arts, in Maui.